Since the light sport aircraft rule was first proposed, we’ve scoured the world looking for well-built and interesting aircraft that meet the new rule. That’s how we selected the SportairUSA collection. 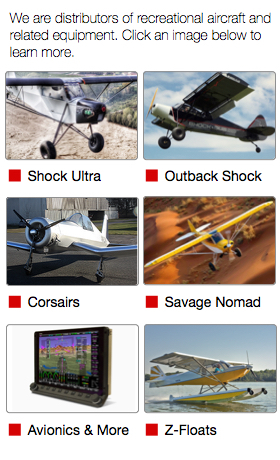 We sell and service the hyper-STOL Savage Nomad Shock Ultra and the Savage Outback Shock from Zlin Aviation, along with the remarkable new Corsair 103 factory finished ultralight from JH Aircraft. We also distribute Z~Floats, amphibious floats for light sport, ultralight and experimental aircraft. For more information, please click on a picture below to visit a dedicated website. 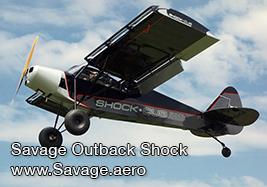 Made for adventure, the Savage Nomad Shock Ultra stands out with its hyper-STOL wing profile for short takeoff & faster rate of climb, double slotted fowler flaps for low-speed control, optional leading edge wing slats, oversized outboard shock absorbers to tame the landings, flattened landing flare that lets you see the landing site and a minimum flight speed of 17 mph (solo) and 21 mph (MTOW). For more information visit the Savage Web Site. The Corsair 103 is a factory finished, ready-to-fly, Ultralight aircraft that embodies the spirit of WWII-era Chance Vought F4U Corsairs, right down to the radial engine, blunt cylindrical engine cowl, sliding cockpit canopy and inverted gull wings. Fabrication is an Oratex covered, state-of-the-art, carbon fiber space frame with carbon-reinforced Kevlar safety cell surrounding the pilot. For more information, visit the Corsairs Web Site. Super performance. Available with Rotax 912/914 power. Exceptional low-speed control and very low stall speed. 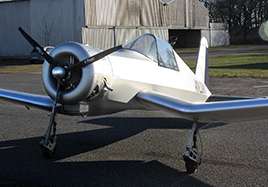 Zlin Aircraft manufactures a high performance and affordable off-runway airplane. The Savage Shock Ultra flies like a Super Cub, only better, and incorporates modern technology in a traditional wrapper. 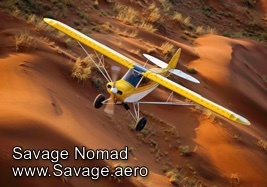 Runway Optional: The Savage Nomad is light, tough and powerful, delivering 515 lbs of useful load along with short take-offs and landings in an affordable light sport aircraft. With optional bushwheels and extended gear, the Nomad becomes a master of the bush, serving more fun per buck than any other light sport aircraft.